Our visit to Switzerland in early June 2011. These panoramas on page 1 are stitched composites of large photos and, at full size to show all the detail, they may be several times the width of your monitor. They are best viewed by moving the cursor to the larger image at right, selecting the "O" or "original" image size and moving the slide bars around. For best overall viewing use the "slideshow" option at top right-the pictures are much sharper that way. Wikipedia and other reliable sources provided the caption facts. I am sure our great guide Werner told us a lot, but when I am making rapid photo decisions not much else gets thru to me! Enjoy the trip. 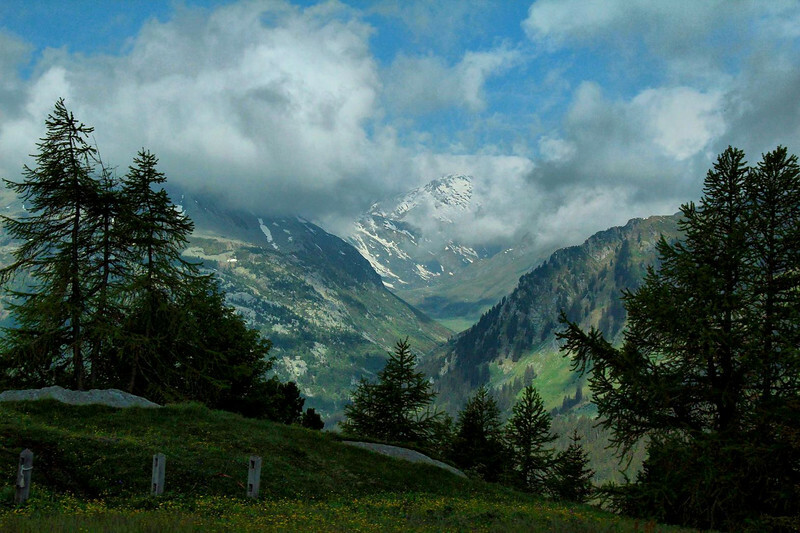 Swiss Alps between St. Moritz and Lake Lugano, Switzerland. Shot from the bus seat.